LBJ Grandmother's Fan Club fired up for finals! Some sassy seniors are fired up for The Finals and predicting their favorite son, LeBron James, will lead the Cleveland Cavaliers to an NBA title. The LeBron James Grandmother's Fan club-- now in its 10th year-- has more than 200 members. Most of them live in the Akron area, but some have signed up from as far away as New York, Georgia and North Carolina. "The championship is coming to Cleveland by way of Akron," said Alder Chapman, the club's president. 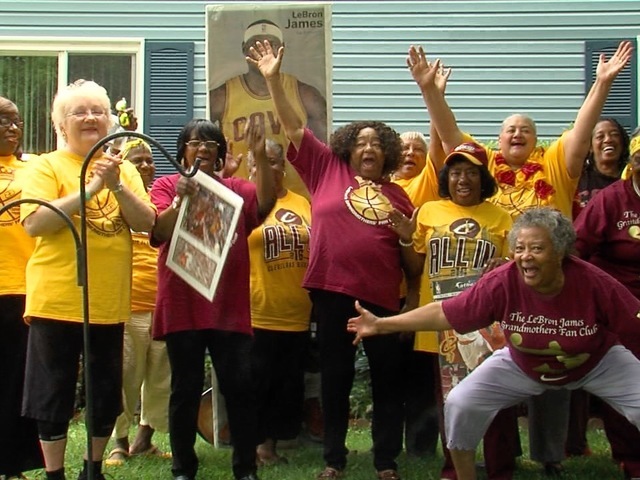 On Thursday afternoon, about a dozen of the grannies, decked out in wine and gold Cavs shirts, gathered at Chapman's Akron's home. They carried LeBron scrapbooks and posters. One lady even brought a life-sized, 6'8" cutout of LBJ. The seniors broke out into several chants inside and outside of the house, including, "Let's Go Cavaliers! Let's go! Bring it home! Bring it home Cavaliers! Bring it home!" The ladies are planning some finals watch parties at local restaurants. Some of the details will be discussed at the group's monthly meeting scheduled for Thursday evening. "We have spirit. We still have spirit and we're able to move and this helps us exercise too when we're jumping up and down," said Dolores Golson. "I pray before he starts, and when it gets rough, I pray. I cross my hands, my feet, my everything," added Berlene Anderson. The club has also organized an outreach ministry at nursing homes along with a self-esteem mentoring program for Akron elementary school children. On June 18, the grannies will host Sound and Taste of Soul at the Helen Arnold Community Learning Center from 5 p.m. to 8 p.m. Food made by the ladies and vendors will be sold with the proceeds benefiting the mentoring program.